The frequency of this Celestial Music communicates with the Divine Intelligence of the body at a cellular level raising the consciousness of each cell. As the music soothes and comforts the cells, the body’s natural ability to heal itself is enhanced. This sacred music is compatible and works in harmony with every healing modality or medical treatment a person may c hoose to experience. The music resonates with an additional blessing for everyone who is dealing with any form of cancer. Enter your email address and you'll get instant access to your download link. 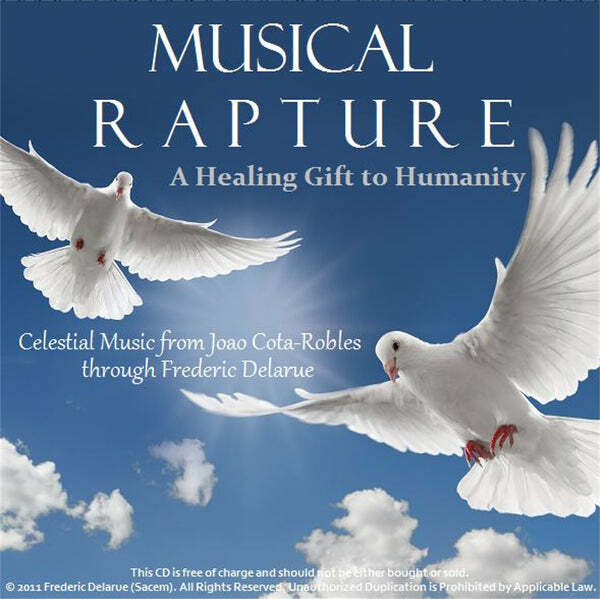 Frederic Delarue and I are delighted that Joao’s music “Musical Rapture…A Healing Gift for Humanity” has touched so many hearts and blessed so many people. Your enthusiasm is wonderful! We have had many people ask if they can use the music as background for their webpages, meditations, webinars, voice-overs, and other recordings. I am sorry, but we have to deny those requests, so that the Divine Intent of this sacred gift of music will be protected. If a person records other information over the music, it will interfere with the healing process and the Divine Intent of the music. You are welcome to make CDs of the music and share them for free with everyone you know. You can print out the images for the cover of the CD and the CD label on the download zip file, and create CDs for your personal use and to give to your friends and loved ones without cost. You can also listen to the music in your groups and during your healing sessions and meditations. Be creative in the use of this wonderful gift of music, but please do not speak or record anything over the music. Please be patient when downloading files as they are very large. I would like to share with you information about a sacred and wondrous musical gift that is being given to Humanity. The Divine Intent of this gift is to assist each of us through the physical challenges we are experiencing as we move through this auspicious time. Please read these words with an open heart and an open mind. We have been longing for the time when Heaven and Earth would come together to assist us in our endeavors to transform this planet and ourselves. This is that moment. That Lunar Eclipse took place within two degrees of the Galactic Center, which opened a mighty portal of Light from the Core of Creation into the Center of the Earth. The Light of God that poured through that portal initiated incomparable pivotal changes for all Life evolving on this planet. When Frederic Delarue, a wonderful French musician, received my e-mail announcing our son’s transition into the Light, he said he felt very connect to Joao’s soul. Frederic said that he knew Joao was trying to connect to with him and that he needed to be at Joao’s Celebration of Life ceremony, which took place on January 8, 2011, in Tucson, Arizona. Frederic agreed to Joao’s request without knowing any of the specifics about the music. After Frederic returned from Joao’s Celebration of Life ceremony, Joao began to reveal to Frederic just what this music would be, a Healing Gift for Humanity. For the next few months after Joao’s transition, Frederic said that Joao would come to him and tell him some things about the music and how it was to be distributed. Then, just before Easter, Frederic awoke with a powerful heart prompting to go to France immediately, so he made arrangements and flew to France. During the month of May in 2011, while he was in France, he went to Rennes-le-Chateau on several occasions. Rennes-le-Chateau is a sacred focus of Mary Magdalene, who is at this time working with Mother Mary and all of the Feminine Aspects of our Father-Mother God to bring to the consciousness of the world the return of the Divine Feminine, our Mother God, or as we have often referred to this Aspect of Deity, the Holy Spirit. Frederic said that when he sat in the church and contemplated the Presence of Mary Magdalene, he had a miraculous experience that transformed his life. He returned home a different person. He knew that his experience with Mary Magdalene was a necessary factor in preparing him to receive Joao’s gift of healing music for Humanity. In May 2011, as we each slept at night, our I AM Presence escorted us into Beloved Mother Mary’s Temple of the Immaculate Heart in the Inner Planes. Within her focus of Light, Mother Mary helped our I AM Presence to expand the Threefold Flame in our heart to its original intensity. This is the fulfillment of the covenant Mother Mary made with each one of us prior to this embodiment. On June 10, 2011, Frederic sent me an e-mail and said that he wanted to talk to me about Joao’s music. I did not know anything about Frederic’s trip to France and he did not know anything about the gift that Mother Mary was giving to Humanity during the month of May. We talked about those things and he said that since he returned from France, Joao would not leave him alone about the music. He said Joao seemed to feel that there was now an urgency to make this music available to the world. Frederic asked me to ask Joao about the music to be sure that the message he was receiving was correct. Right after I received the e-mail from Frederic Joao’s Dad called me into the kitchen to see a magnificent White Dove that had flown into our garden. We have lived in our home for 45 years and we have never seen a White Dove in our garden. The complete CD of “Musical Rapture” is 62 minutes long. You may download this sacred music for FREE on this page. To protect the integrity of this Celestial Music, it has been copyrighted in Frederic Delarue’s name and all rights are reserved. The music is never to be bought or sold.